The reviews are positive, but the sentiment towards Epic is not. When Deep Silver and Epic Games announced that Metro Exodus would be an Epic Games Store exclusive, angry 'fans' review bombed the other games in the series in impotent retaliation. Now, with Exodus out, the opposite is happening; players are leaving positive reviews on Steam, but they're still really mad about the exclusivity deal. Metro Exodus isn't out on Steam yet, but The Epic Games Store doesn't currently have user reviews, so it makes sense, I suppose, for people to use the closest alternative. Despite appearing somewhere where the game isn't actually sold, some of the reviews seem genuine, critiquing the game or just saying that they're enjoying it. More prominent, however, are the positive reviews that criticise Epic. Some of them have things to say about Metro Exodus, too, but they make it very clear that it's a good game despite being sold in a shop that isn't Steam. A few have nothing to say about the game at all, only targeting Epic. The only difference between these and review bombing runs is technically they're positive. One review calls an entire shop a cuck. "Genuinely, one of the best story driven games I have ever played," reads one pretty typical review. "A shame that the publishers, not the devs, messed up the games success by choosing to take the cash and push the game to the Epic Games Launcher. Would definitely say that this game is worth the purchase, if it ever comes back to Steam." 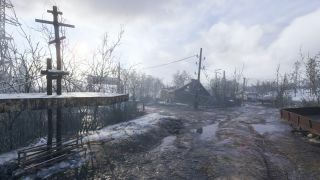 Wherever Metro Exodus ends up being sold, it's a pretty great shooter with gorgeous environments. As Andy notes in our Metro Exodus review, the flimsy guns are offset by "an incredible trip through a stunning post-apocalyptic world".